MMT-One stop solution for CNC machining, capillary tubing, Optical Lens, Casting, Platic Injection componnets, aub assembly from China _Machining Matrix Trade(Shanghai) Co.,Ltd. 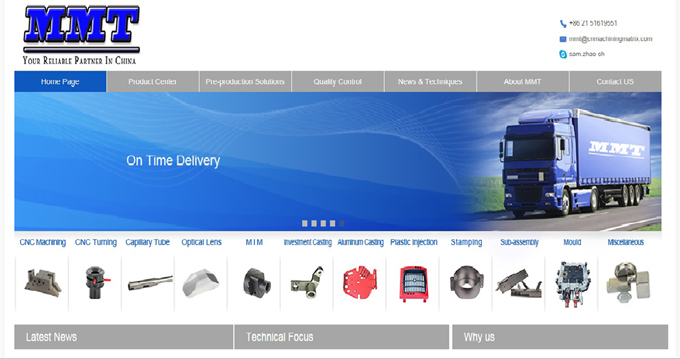 We are very excited to announce the launch of our newly designed website www.cnmachiningmatrix.com on Jan 8,2017. MMT, as your one stop solution partener in China , it’s important for us to make information regarding our products & services easily accessible for our current and prospective clients. The metal powder molding process(MIM) has four important processes:molding,de-binding,sintering and post-treatments. MMT has the toolings and ability to bend metal tubes ranging in size from small capillary (micro) tube up to 8mm diameter for a variety of applications. We bend round tube, square tube, and various other extruded or drawn shapes. A: MMT is a professional one stop solution company located in Shanghai China. Know how knowledge in casting,CNC machining,Metal sheet facrication,plastic inejection parts,non standard fastners,sub-assembly,casting,injection moulds;more than 50 professional suppliers in China and our own workshops in Changshu with advanced machining equipmets make us could supply the total lowest cost components to our customers.MMT supply not only high precision components and sub-assemblies, but also professional technical service. The staff has been doing this since 2000s. Q: What are the highlights of MMT process? A: PSA(Potential Supplier Assessment):If your projects beyond our supplier resource, we will run PSA,and sort out right and optimal suppliers for you, avoid wasting your time and cost on wrong supplier. Of course for our current suppliers, we will provide the PSA report if you require. OQL(Open Question list):a very effective and simple technical communication file, special in the inquiry stage. MMT engineers will analyze the requirement of material, physical performance, tolerance, surface treatment, package, then list the unclear questions or technical issue in the OQL and communicate with customer. Only in this way, MMT could provide a precise and competitive offer to our customer, and avoid potential re-start or failure risk on product devoleping stage. This form is implemented from project launch to finish. MSR(Milestones Report):our engineers visit supplier to follow up the project on milestone, sort out the problem and fix them, make sure the project run as schedule.Meantime,we also send reports to customer, let customer feel like follow up the project on site, saving customer on the expensive international traval expense. Concerning the other process documents like time schedule, control plan,8D report. It is our rutin’s process for the project following-up.